Most people realize that migraines are a common problem for adults, but did you know that kids frequently get migraines as well? About 10% of children suffer from migraines, and the number of boys with migraines actually outnumbers girls until puberty sets in. Here are some things that you should know about migraines in children. And if your son or daughter gets migraines, we will also present you with a safe and effective form of natural care to consider. Did Your Child Inherit Your Migraines? The short answer is no, so there is no reason to blame yourself. However, the genetic predisposition to migraines is inherited. That is why a migraineur has a 50% chance of having a child who gets migraines. If both parents are dealing with this condition, the children have a 75% chance of getting migraines as well. In fact, when a person is diagnosed with migraines, there is a 90% chance that he or she has a close relative with the same issue. How can you tell if your child is dealing with migraines instead of ordinary headaches? 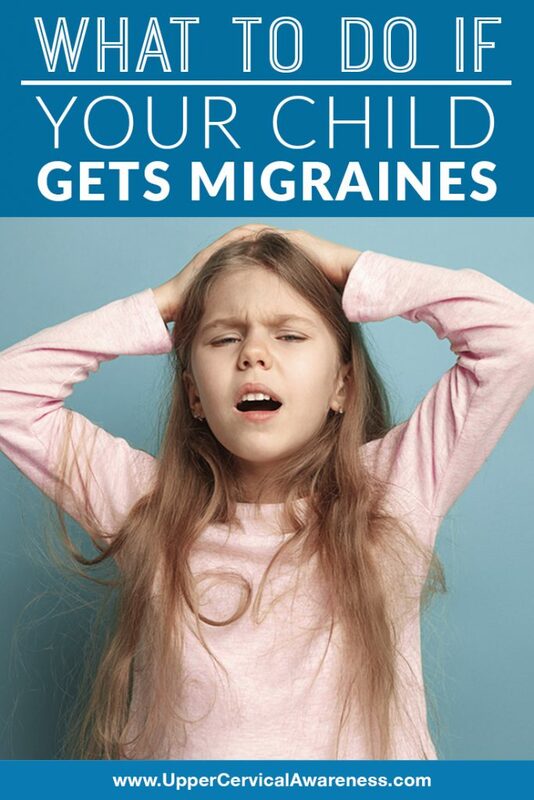 Many of the migraine symptoms that kids deal with are similar to those of adults. Besides the pulsing or throbbing head pain, some of these other symptoms are likely. Dizziness – Vestibular migraines account for about 40% of migraines in adults, but dizziness seems to be a more common symptom for the young, especially teens. Depression and anxiety – Rather than symptoms, these are commonly occurring conditions that accompany migraines. Since migraines are neurological in nature, also having other mental health ailments makes sense. Concentration problems – It may not be ADHD. If your child struggles with attention and gets headaches, migraines could be to blame. Exhaustion – Between the pain and other symptoms, your child may seem tired all the time. Don’t write it off as laziness when migraines could be the real problem. Insomnia – Migraineurs frequently have trouble sleeping. This only serves to add to the exhaustion, concentration issues, and potential for mental health problems. Other migraine symptoms are not part of the actual attack but are part of the prodrome – symptoms that occur within 24 hours of a migraine headache. If your child gets migraines, you may be able to predict when the next one is about to begin if you observe some of these symptoms. Sleep disturbances – This is more than just trouble sleeping. These symptoms can include night terrors, sleepwalking, or even talking in one’s sleep. Behavioral changes – Your child may become moody and irritable (beyond what is normal for a teenager) and may become very withdrawn or sad. Appetite can also be affected with the child eating less but having certain food cravings. Sensory symptoms – Sensitivity to sensory stimuli is also common. For example, bright lights, strong smells, and repetitive sounds can be painful or aggravating. Even touch and taste may be affected by migraines. Lethargy – Your child may seem less interested in doing things. Yawning is also common, although this may be less due to exhaustion and more due to insufficient blood flow to the brain that is sometimes blamed on the onset of migraines. If you see your child dealing with these symptoms, what can you do? First of all, you will want to start a migraine journal to help your child learn his or her personal migraine triggers. These triggers can include changes in sleep patterns, sensory stimulation, hormone fluctuations, stress, weather changes, skipped meals, and food sensitivities. Once you identify the triggers, help your child to dodge the ones that can be avoided. Next, you want to try and get to the heart of the problem. For some patients, it has been revealed that along with migraines, they are also experiencing an atlas misalignment. For these patients, correcting the misalignment has helped dozens of individuals in documented case studies. Here is what you need to know about a subspecialty of chiropractic care called upper cervical chiropractic. When the atlas (top bone in the neck) is misaligned, it can have a profound effect on the central nervous system (CNS). For example, the atlas surrounds the brainstem. Therefore, even a slight misalignment can affect proper brainstem function. This, in turn, can lead to migraines. It can also affect blood flow to the brain and cerebrospinal fluid drainage – two other factors when it comes to migraine occurrence. In order for CNS function to return to normal, the upper cervical misalignment must be corrected. Rather than popping and twisting the neck, upper cervical practitioners use gentle adjustments to coax the atlas back into place. As a result, this form of chiropractic is safe for patients of all ages. Gentle adjustments also tend to hold longer, which gives the soft tissue the time it needs to stabilize and heal. If your son or daughter is suffering from migraines, upper cervical chiropractic care may be the natural help you have been looking for. Atlas misalignments are common, especially when trauma has occurred (such as from a car accident, a sports injury, or even a fall on the playground). To learn more, contact a practitioner in your area. A no-obligation consultation may be your child’s first step toward conquering migraines. For some kids, that can mean improvements in school attendance and performance once migraines are under control.